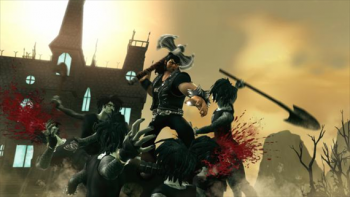 Double Fine big cheese Tim Schafer says Brutal Legend multiplayer expansions are a possibility if the PC version of the game is a success. Brutal Legend didn't exactly set the world on fire when it came out back in 2009, but the PC version announced earlier this month is a second chance for the game to find its audience. And if it does, we might actually end up with even more of it. "I would love to [add more to Brutal Legend on PC]," Schafer told Rock, Paper, Shotgun. "It's actually been fun to continue work on it. I mean, we have a wishlist from when we made this version. But since we are a small developer publishing it ourselves, we have to go with the best version we can make and then hope it's successful so we can add more." Among the things Schafer would like to add to the game are playable factions that didn't make the cut the first time around, improved feedback about what your units are up to and possibly even an advanced gameplay mode with more conventional RTS controls. New single-player content, on the other hand, is much less likely - which is to say, it ain't gonna happen. "Single player requires content, which means reengaging all the voice actors - which is something that was a lot easier for EA to pay for," Schafer continued. "Also, reengaging music licensing. I'd love to do that too, but I think that would involve more funding than we have cash on hand to do." A full-on sequel is a possibility as well, although Schafer sounded somewhat less than optimistic about it. "We could probably afford to do it more if we got some funding. I feel like a Brutal sequel would cost twice as much as Psychonauts," he said. "It's easier to imagine Double Fine doing a sequel to Psychonauts. But for creative reasons, there's no preference of one over the other." The PC version of Brutal Legend is slated to hit Steam on February 26.